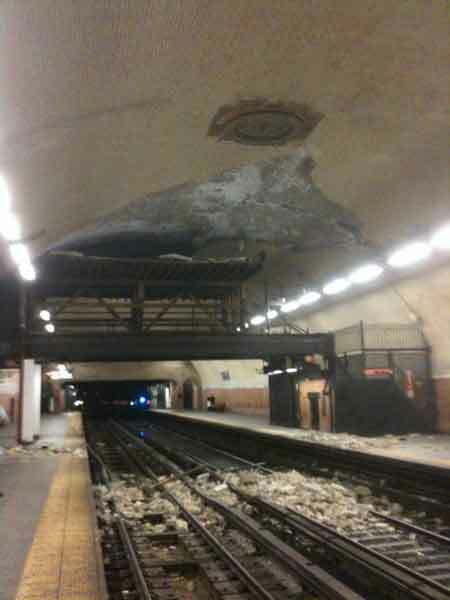 181st Street 1 station after the ceiling partially collapsed in 2009.
Who can forget the image above? when after years of crumbling & decay, the ceiling at the 181st Street station on the partially collapsed onto the tracks in the summer of 2009. Unfortunately this was not the only station with issues as the 168th Street station also had some structural issues. More than a year after the ceiling came down at the 181st Street 1 train station, the Metropolitan Transportation Authority says it is still drafting the best design plan for its repair. The design process for 181st Street — as well as 168th Street, another decaying station in Washington Heights — will continue through the year, with actual repair work planned for the spring of 2012, according to MTA spokesman Marcus Book. Book said the logistics of making repairs to the two landmarked stations, which date back to the early 1900s, have proven more challenging than most. “It seems the original architects relied on physics to keep up the archways,” he said about the stations, explaining that it will take a lot more than replacing a few bricks to properly repair the ceiling. A metal cage has protected riders from falling debris since bricks from a 20- to 30-foot section of the arched ceiling at 181st Street station came showering down on the uptown and downtown tracks at the station on Aug. 16, 2009. Is it just me or is the MTA taking way too long to finalize & start repairing these stations? I understand the architecture is different from most other stations, however it should not take well over a year to figure out exactly how to fix the problems. How long will the metal cage be able to hold out before it possibly gives way? Do we even want to imagine that happening? The agency dodged a major bullet in that the collapse did not happen while a train was entering, departing, or sitting in the station. I have my doubts if they would be lucky again if history repeats itself. Hopefully in the coming months, the agency will finalize plans & start the repair process. While I don’t want a rush job, they do need to expedite the process. I’ll be keeping an eye on this.